Home city team, Paris Panthers, soared around the arena - with riders Nayel Nassar and Gregory Wathelet opting for steady clears to help keep the team at the sharp end of the grid. An unlucky clip of the back rail for Nassar and Lutz added four to their score, and another four from Gregory Wathelet and MJT Nevados S meant they would be out of a chance of a podium. Valkenswaard United knew a double clear from Bertram Allen and Marcus Ehning today would help close the gap to the Knights in the overall championship. Carrying four faults from Thursday, the team had to go clear to maximise their points tally this weekend, but a pole down from Allen and Molly Malone V at the GCL oxer dropped them onto a score of 8 - the same as the Knights. The pressure was on Marcus Ehning and Pret A Tout to ride fast and clear, to be in with a chance of finishing ahead of the Knights who were quickly rising up the order. The German maestro delivered, putting in a brilliant time to keep the team ahead of the Knights today. First of the double clears, Madrid in Motion, took centre stage putting Eduardo Álvarez Aznar and Rokfeller de Pleville Bois Mar out in front. The pair delivered, opting for a steady and careful round which paid off - keeping a clean score and passing the pressure to teammate Marc Houtzager with top horse Sterrehof's Calimero. But the Dutchman kept his cool, piloting the expressive horse to another clear, shooting the team to the top of the leaderboard. Sameh El Dahan of the Giants pulled out a magnificent clear with Suma's Zorro, with the win down to the wire as final rider to compete René Lopez and Twig du Veillon set off a steady canter. But two poles and a time fault would prove costly, dropping the team in pole position off the top of the leaderboard and off the podium. 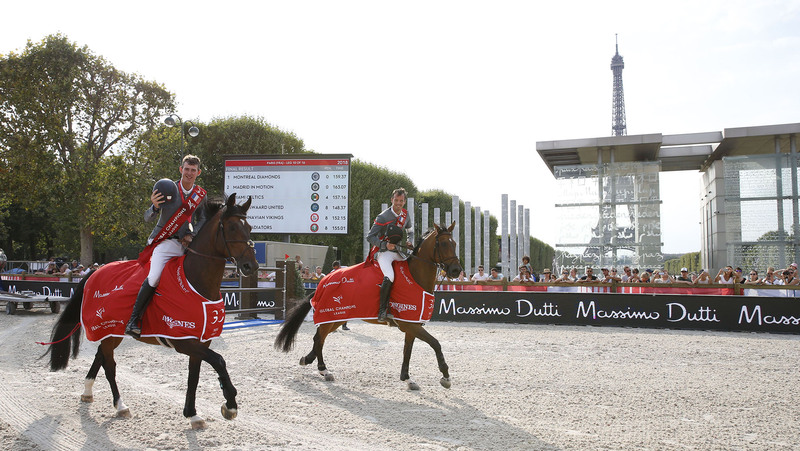 Harrie Smolders, Montreal Diamonds, 1st place: “Now we have our strategy focused on the GCL. I think Don and Igor are in great shape at the moment so we had the feeling we would have a chance here which is why we took them. You’re never sure of a clear! I checked the time before I went in, and Jos did good so I knew we would be ok, but Don did a great job. We will be putting our best horses forward for the GCL - that’s our first priority. It’s very close from 3rd to 7th, so there will be a battle to get into the top four - but that’s our aim and that’s our goal for the next few shows.